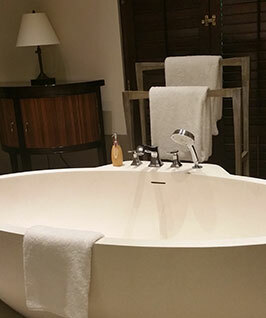 The generously sized Pool View Junior Suite offers a luxuriously furnished twin Queen bedded room (can be converted to a Super King bed) and spacious bathroom with stone bathtub and steam room. Though our smallest room category, the Junior Suite still offers the largest room size of all listed Hotels in Weligama. We checked! The outdoor verandah is furnished for lounging and dining. The Junior Suite can interconnect with the adjacent Master Suite via a double door on the verandah which is ideal for families with children. The Suites overlook the Cove swimming pool including the kid’s pool, tropical gardens and have close access to the East Beach.